Monster High Ear Doctor is an interesting puzzle game. This game has unique graphics, suitable for all ages, especially children and families. You can experience this game on your browser because it is a flash game. In this game you are a doctor. Purrsehone and Meowlody (cats) are having trouble with their ears and they are very sad. Your task is to treat the ears of your lovely cats and make them happy. Cleaning: You will clean the ears for your cats. Then you will remove the insects in the ears of the cats. Medicating: You will inject into infected sites in the ears of cats. Then, you will put the medicine in their ear. Do not forget to add beautiful earrings to your cats. 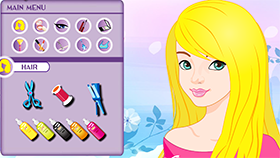 With simple gameplay and cute graphics, Monster High Ear Doctor will bring you the most comfortable moments. Good luck and have fun!